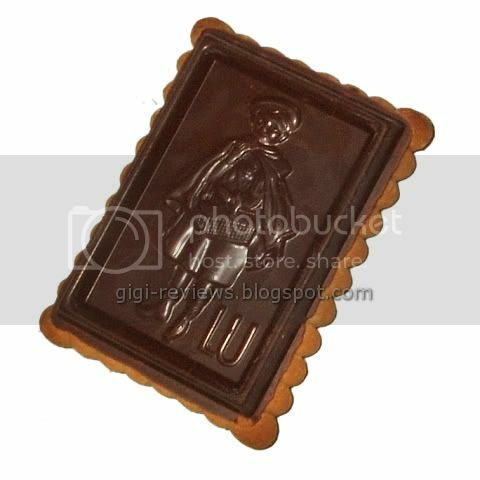 Yes, I know the Petit Écolier ("Little Schoolboy") biscuits have been LU's best known product practically forever. But there is something Hannibal Lecter-ish about these cookies. I mean, isn't there something vaguely disturbing about eating a cookie embossed with the likeness of a little French schoolboy? (Yes, he is French. LU -- short for Lefèvre-Utile Biscuit Co. -- was a French company before Kraft bought them out, and they're still made there.) It just seems a bit...unhealthy. To be fair, though, the little French boy doesn't look entirely normal himself. He's got that glassy stare that makes you imagine his neighbors on the news years later, saying things like "he was such a quiet man" or "he always kept to himself"...so maybe it makes more sense than I thought. And what snack is he carrying in that basket, anyway? Cupcakes? More LU biscuits? Or...dare I say it...lady fingers...? Aside from possibly being the favorite childhood snack of Dexter, the Petit Écolier Biscuits sound pretty darn yummy. 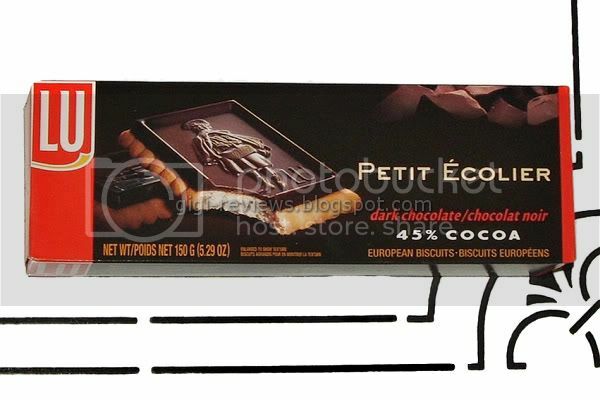 The slab of 45% dark chocolate that the creepy little French boy is bas-reliefed upon sits atop what the box describes as a French Butter Biscuit. Once you bite into the biscuit, you realize that the chocolate layer is not as thick as you might have expected. 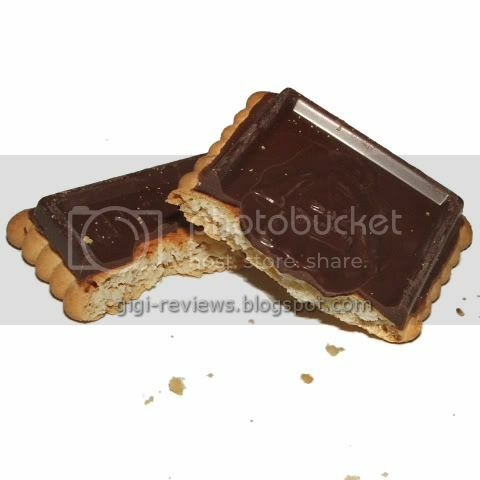 While the edges are raised and thick, the layer of chocolate that covers the center of the biscuit is thinner than it appears. But that's not such a bad thing. Actually, the proportions are very good. The chocolate is rich and creamy, though personally I think it is more of a deep milk than a true dark chocolate. The biscuit is indeed buttery. You know those ubiquitous "gift" tins of Dutch butter cookies that are sold everywhere around the holidays? These biscuits are like a really high-quality version of those cookies. Butter is the strongest flavor. (Sometimes butter cookies just taste oily, but these don't.) The texture is light and flaky. Combined, the two flavors together make sheer happiness. Happiness as in puppy dogs and rainbows rather than fava beans and a nice Chianti. The relative simplicity of the biscuit sets off the richness of the chocolate. At the same time, the richness of the chocolate highlights the buttery goodness of the biscuit. The only thing I would have liked to have seen -- beyond a less creepy stare on the little French boy -- would have been a little extra salt. That would have really set the whole cookie off. A good cookie/biscuit/serial killer treat overall. In fact, I'm willing to bet even normal people will like it a lot. Horray for MOM!! Bought it online from Georgia at Von's in California.. am I good or what?????????????????? ?